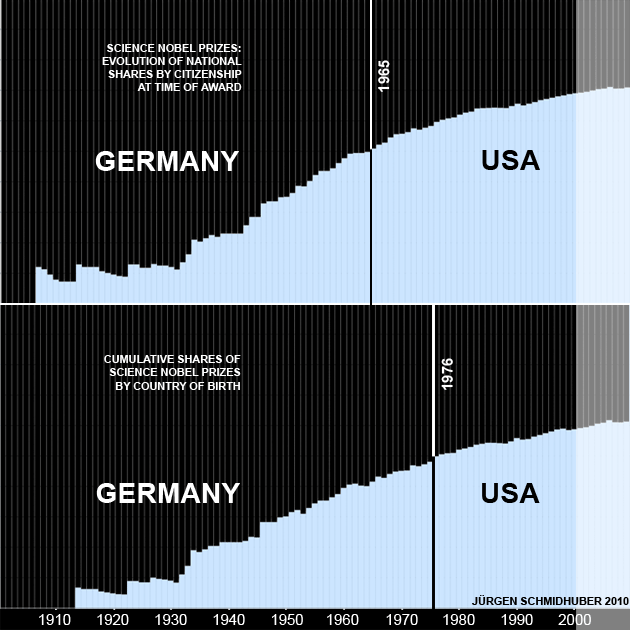 Figure 15: Science Nobel Prizes 1901-2009: Evolution of cumulative national shares by citizenship at the time of the award (top), and by country of birth (bottom), considering only the two most successful nations, to focus on this particularly prominent geographic shift during the 20th century. Note the differences between the birth-based and the citizenship-based ranking, due to brain drain from Germany and other countries to the US: In the last third of the century, US citizens took over; in the last quarter of the century, US-born laureates took over. From Evolution of National Nobel Prize Shares in the 20th Century, Jürgen Schmidhuber, 2010. PDF. HTML.